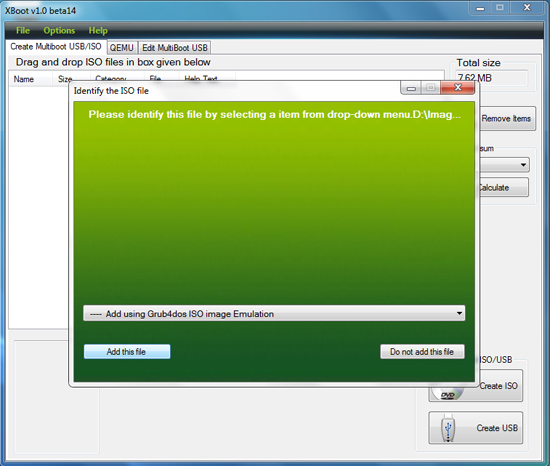 XBOOT is a simple but exciting utility that helps you to create multiple ISO images based on other images of live CDs and then use them burning them in a DVD or recording them in a USB. XBOOT is interesting because it allows you to have a single device or DVD that is capable of booting several systems or live CD utilities, easily selectable through a boot menu. When selecting each image it is possible, if you need it, to go directly to the download site to get them. Then click on the option to create a DVD/USB, and that’s it. The negative point? As indicated on their web page, at the moment you can only use the ISOs that are supported to create the multi-images, that is, they must be in the drop-down list of the app. To try to give a solution to this, the Grub4dos ISO Emulation utility has been included, with which it tries to support images not included. XBOOT is based on .NET Framework 4, so it is essential to have these libraries installed to make it work, both 32-bit and 64-bit systems. You can create both DVDs and USB Memories. You can create a bootable medium with different Operating Systems. You can perform a test of the final result without restarting the computer. Once downloaded, you must unzip it. Start XBOOT with double click to the file xbootvs1.0beta14.exe. Drag the ISO image of the Operating System. If the ISO is supported by truthful XBOOT that is added without asking for more information, otherwise go to step 5 and 6. If XBOOT doesn’t support the ISO, you must choose the correct option for each ISO in the drop-down menu, if it doesn’t appear in the list as in the case of Windows 7 you can select grub4dos iso image emulator. Click on add this file, and ready with these steps you can create your USB stick or multiboot DVD. Once you have added the ISO images of your operating systems that we want to include, XBOOT gives you the possibility to edit and change the appearance of the start menu that will allow you to select the Operating System that we want to start. It is effortless in the name box you select the name of the operating system, and double-click to edit, as here it shows you the name of the file we have the option of giving it a more straightforward name to identify your OS. On the other hand, XBOOT also provides you with the ability to group your OS by categories, for example, if you add Windows XP and Windows 7 we can give it as a Microsoft category, and if you add Ubuntu and Tails, you can give it the group of Linux. As easy as that you can use XBOOT to create multi-iso boot USB drivers. Just download the app from the official website.